Buzzed Bull Creamery harnesses the power of liquid nitrogen to bring you and your family fresh, premium ice creams and milkshakes while offering a a one-of-a-kind-experience. We hand-craft each ice cream and milkshake to provide a fully customized option. We are making ice cream fun for everyone. For adults, we specialize in alcohol-infused ice cream & milkshakes that start at a 5% ABV. We encourage our guests to get creative with over 30 available flavors and enjoy the fun the innovative use of liquid nitrogen offers. The possibilities are truly endless. Our goal is to provide a warm and inviting place the local community can connect, a place where you welcome new neighbors but see familiar faces. Buzzed Bull Creamery aims to create a community-driven following that encourages growth and support. Our team will strive to connect ourselves on a professional and personal level at every opportunity. Without compromise, receive a one-of-a-kind experience with a premium product. All orders are made when you order it. This allows a fully customized frozen dessert option. We use Liquid Nitrogen – breaking the mold of a one-ice-cream-fits-all. 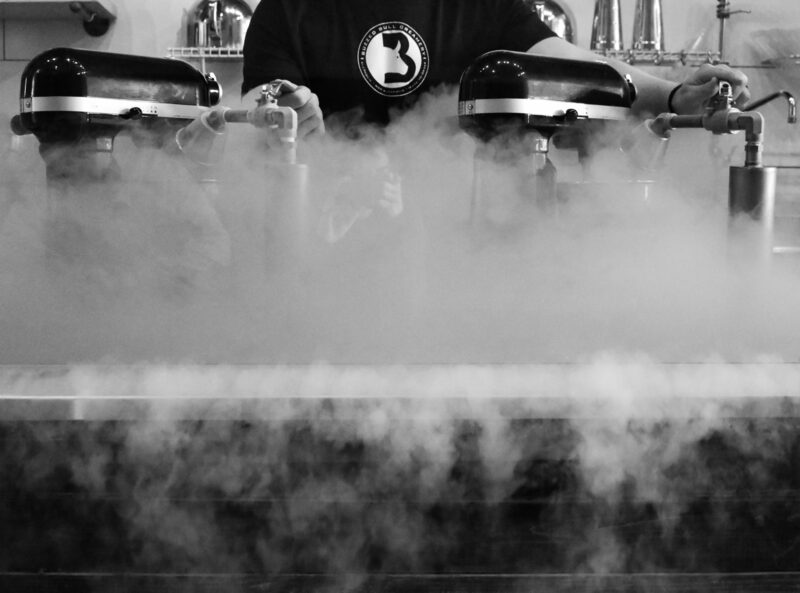 Our made-to-order process is coupled with Liquid Nitrogen. See first hand how it’s made with every order. Thanks to science, you experience the creamiest ice cream. We want you to know we value and strive to maintain a clean and organized environment. Providing a clean space is important to ensuring you feel comfortable while enjoying your dessert creation. AMAZING! Such a fun environment and the ice cream is incredible. My favorite is the Bonfire! The staff is super helpful and very friendly as well. HIGHLY RECOMMEND! My first experience with a buzzed (alcoholic) ice cream.... The ice cream is prepared right in front of you using liquid nitrogen, which is fun to watch. They have decent flavour options especially in their build your own. Service is good. Delicious place for some ice cream! It's really cool that they can add alcohol to your ice cream. They have a wide variety of flavors and the atmosphere of the place is really cool. I would definitely return. Greatest idea ever! This place is a blast. I had a chocolate coconut rum cup! Yum! Soo good!!! Such a unique take on ice cream! I didn't get alcohol in mine but the ice cream was amazing on its own! I would HIGHLY recommend. The buzzed ice cream is amazing! My favorite is the Honey Bourbon Pecan. This is a great concept. I got peanut butter flavored ice cream with spiced rum and the alcohol taste was very prevalent, which would be good for some people but it was a little too strong for me. First time ever having boozy ice cream and it was fantastic! Super chic space and open layout for viewing so you can see the entire creation process. There are plenty of options to choose from including a build your own menu for ice cream and shakes. The orange creamsicle was a dream! Will definitely be back. Looking for a way to taste test your way around the menu? Or some inspiration to create your own ice cream or milkshake? We introduce our Monthly Flight. Comprised of 4 flavors rotated out monthly, enjoy 3 ounces of each buzzed ice cream served on a hand crafted paddle board.